The package includes an After Baby DVD set from Knocked-Up Fitness, a Mixie 8oz bottle and an Aden & Anais Organic Swaddle of choice! Total value of about $84! 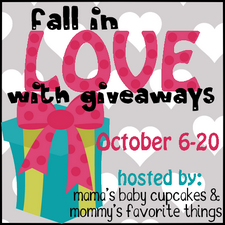 This is a great prize for an expecting or new mom! Great for a baby shower gift! I am excited for the Aden + Anais swaddling blanket. I am expecting #3 this December, so I would totally be keeping everything for my little guy and myself! Thanks for the chance. This is for me! :P I am most excited for the After Baby Dvd. Due in Jan and would love all the help I can get, for after baby body. Thanks for the chacne! I'm keeping this for myself and I'm excited for the A&A swaddle! I'm most excited about the After Baby DVD! I would give this to my granddaughter who is expecting her boy in December. I am excited for the aden and anais swaddle blankets. I am expecting my first baby in November, and will definitely be keeping this for myself and him :) I am really excited about the Knocked up fitness dvd and the Aden and Anais blankets! Thank you! This will be a gift for my son and his new baby. the organic swaddle looks beautiful! i would like to give this as a shower gift! this is an amazing giveaway thanks for this chance i would give this package to my daughter who just gave us our first beautiful grandson a gift from heaven thanks!! If I won I would give this to my daughter-in-law. My granddaughter is due in November. Great giveaway! I love them all, especially the Mixie 8oz bottle. I would love to win them for my baby! I am most excited for the Knocked Up Fitness DVD! I'd love the swaddle for me! I am super excited about the Knocked Up Fitness DVD. I'm excited for the Aden & Anais swaddle blanket, I would keep for my baby due in the spring! i would give this to my sister in law who is having a baby! I am due 10/14 so I would keep this for myself. I am most excited about the aden+anais swaddle. I'm definitely excited about the fitness dvd set! I have been looking for one of those for my best friend who is expecting, and yes she wants it - it wouldn't be a bad gift! 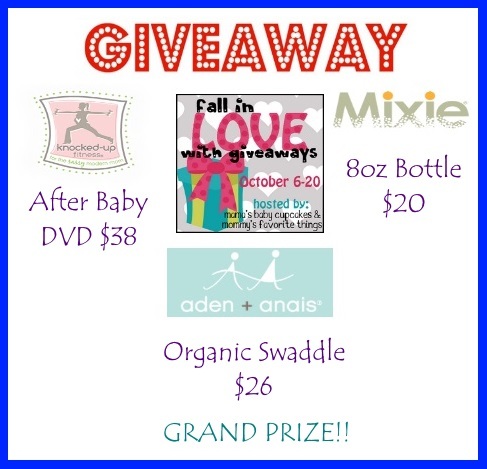 I would love to win the Aden + Anais swaddle. This would be for my daughter and her newborn baby boy! I'm looking forward to the Aden + Anais swaddling blankets and I would keep them for myself. If I win I'd give this to my sister in law due with her first. I would love the swaddle for my baby girl! ive heard wonderful things about aden and anais! I am excited about the aden and anais blanket. I would give it to my son. I would be most excited for the Aden & Anais swaddle. I love their products! I am most excited about the workout DVD! I like the swaddle. I would love to win for my cousin who is expecting. I would give this to my daughter in law who is expecting a new grandbaby for us in April. I am most looking forward to the After Baby Fitness DVD! My baby is almost two months so it's about time to get back in shape! I am excited about the DVD! This will be a gift for my niece, who is expecting her little girl in December. The Aden & Anais Organic Swaddle would make the perfect baby gift! And my sister-in-law is expecting her second boy next month! I am most excited about the Aden & Anais Organic Swaddle. I'm definitely most excited about the a+a swaddle blanket! I'm looking forward to all the prizes! I'm especially excited about the Aden and Anais! We are expecting our very first little one in January! I'm the most excited about the Aden + Anais swaddling blanket.